Hollie Strano may not have gained international prominence, however, the American meteorologist is well-known in her native Cleveland where she has since showcased her weather talents, working for the WKYC TV. She is the co-host of Channel 3 News Today which airs weekdays from 4 am to 7 am. Strano also hosts Live On Lakeside, a 90 minutes segment that airs Mondays through Thursdays on the same WKYC TV channel from 11:00am-12:30 pm. We take a look at Strano’s journey through her career thus far as we highlight some facts about her personal life. Hollie Strano was born on the 3rd day of December 1972 in Lyndhurst, a city in Cuyahoga County, Ohio, Cleveland. Strano has two younger siblings including a sister Stephanie and a brother named Mike. Her brother has at least three children from his marriage. Hollie Strano began her education at the Catholic school, St. Clare Grade School in Lyndhurst. For her high school, Strano attended yet another religious school, the Notre Dame-Cathedral Latin School in Chardon, Ohio. One of the most notable alumni from the school is YouTube personality and wildlife educator, Coyote Peterson. Following her high school graduation, Hollie Strano went on to attend… you guessed right! another Catholic institution, this time, the private, coeducational Jesuit Catholic university, John Carroll University. Upon graduating with her meteorology degree, Strano proceeded to the Mississippi State University where she received her National Weather Association Seal, certifying her as a competent meteorologist and on-air weather reporter. Following a period of paying her dues, Hollie Strano became a celebrated meteorologist working for WKYC TV and her bubbly personality made her a favourite of many. Licensed in Cleveland, Ohio, WKYC TV is an NBC-affiliated TV station. The station is primarily owned by TEGNA Inc., a publicly traded broadcast, digital media and marketing services company headquartered in Virginia. Other affiliates of the WKYC TV include Justice Network, Cozi TV, and Quest. Hollie Strano is an early bird and has described herself as being constantly sleep-deprived. The TV personality revealed to Cleveland.com that 1 am has become one of her favorite times of the day, it is the period when she’s not only up and ready for her weather reporting that airs weekdays by 4 am but also gives herself a pep talk about how glorious her day is going to be. Her consistent hard work and charming personality have seen her grow at the station and now, she is hosting her own show, Live On Lakeside – a 90-minute program that discusses issues affecting the Cleveland people from lifestyle to news, entertainment and of course weather. Strano hosts the show with friends including fellow WKYC Meteorologist, Michael Estime, other WKYC personalities; Alexa Lee and Joe Cronauer, as well as Larry Macon, the co-pastor of Mount Zion Church of Oakwood. A pretend cook, Hollie Strano sometimes takes her viewers through some of her favourite food recipes from baking to everything else. The details of Hollie Strano’s earnings have never made it to the media light, thus, it is almost impossible to determine how much the TV personality takes home from her job as a meteorologist. That said, a trip to her social media pages shows that Strano has done quite well for herself. You Might Also Like: Who is Ginger Zee, What is Her Salary, Husband, Baby and Family Facts? Is Hollie Strano Married to a Husband or Divorced? Hollie Strano has been married and divorced twice. Her first marriage was to her high school sweetheart, Brian Toohig. The couple divorced in 2011. They had two kids together, Jessica and Grady Toohig born in 2005 and 2006 respectively. 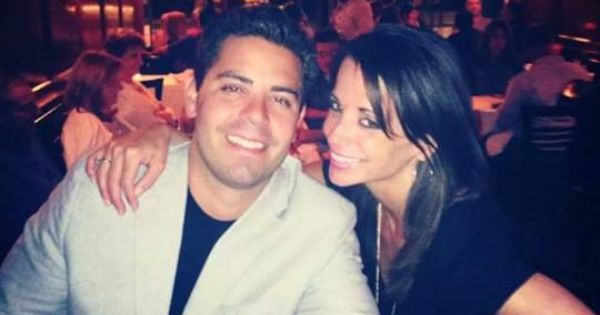 Strano then married Florida native Alex Giangreco in June 2014. Upon their marriage, Hollie took up his surname and went by Hollie Giangreco, however, she reverted to using Strano following their divorce which she announced in May 2017. Hollie Strano is physically on the small side, the WKYC TV personality stands at a height of 5 feet 3 inches and that is without high heels.